FREE BOTTLE OF WINE when you stay between NOW till 30 NOVEMBER 2017. One bedroom apartment with full kitchen facilities including fridge, microwave, crockery and cookware. Also has air conditioning/heating, remote control colour TV and ensuite with shower and toilet. Bedding configuration is one queen bed and double fold out sofa bed. Rates are based on 2 adults. Up to 2 children under the age of 12 stay free of charge using existing bedding. Any additional adults or children will be charged at $25 per person. One bedroom apartment with full kitchen facilities including fridge, microwave, crockery and cookware. Also has air conditioning/heating, remote control colour TV and ensuite with shower and toilet. Bedding configuration is one queen bed and double fold out sofa bed. Rates are based on 2 adults. Up to 2 children under the age of 12 stay free of charge using existing bedding. Any additional adults or children will be charged at $25 per person. What a great location! 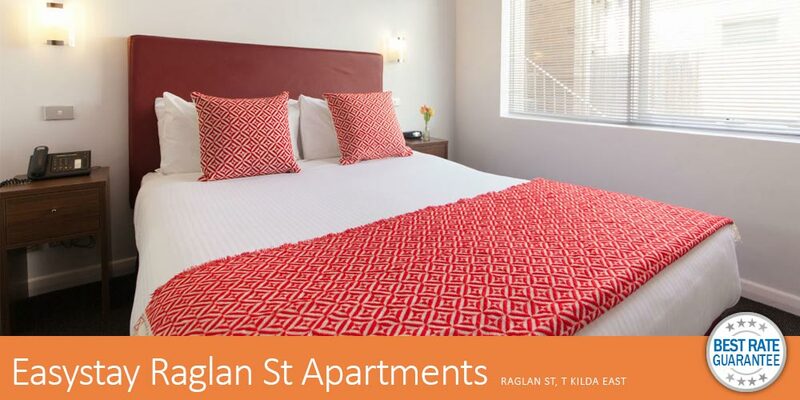 Easystay Apartments Raglan Street offer families and travellers an affordable place to stay in Raglan Street in fabulous St Kilda East. We are located close to Chapel Street, Acland Street precint (and those infamous cake shops), Luna Park and St Kilda Beach. Trams to the city are within walking distance so you can be in the Melbourne CBD within 10 - 20 minutes. Guests can stay in comfortable One bedroom apartments which are all equipped with full kitchen facilities. All apartments include en-suite, full kitchen facilities including fridge/freezer, microwave, crockery and cookware, remote control colour TV & personally controlled heating/air-conditioning. The apartment can accommodate up to 3 guests. Bedding configuration consists of a queen bed and a double fold out sofa bed. Up to 2 children aged 12 and under can stay for FREE when staying with full paying adults and using existing bedding, subject to availability. Check in for all apartments is at the Easystay Reception situated at 63 Fitzroy Street, St Kilda. All apartments are allocated upon arrival, whereby you will be given the location and address of your Studio apartment, which is nearby to the Easystay Reception. We are able to offer a complimentary transfer to your apartment at Raglan Street upon arrival when arranged on check in. Limited on/off site car parking is available at an additional charge per night, which is subject to availability. Reception Hours : Reception 7am to 11pm. 24-hour Check-in available. Please note that this property has no reception. Check in for all apartments is at the Easystay Reception, located at 63 Fitzroy Street, St Kilda. All apartments are allocated upon arrival, at which point guests are provided the location and address of their apartment, which is near the Easystay Reception. The hotel offers free transfer from the Easystay Reception to the apartments on Raglan Street. After Hours : 24-hour Check-in available. Guests arriving after 11:00pm can use the courtesy phone outside the Easystay Reception for express check in. Car Parking : Limited on/off site car parking is available at an additional charge of $18.00 per night, which is subject to availability. Catch any tram from the city with St Kilda beach displayed on it, or catch number 96 from Bourke Street, 16 or 3a from Swanston Street or number 12 from Collins Street. Get off the tram at the Park St stop - this is directly outside 63 Fitzroy St and the Easystay Reception. For the no. 12 tram, this is the end of the line. For the 96, 3a and 16 trams, listen for the stop announcements. To use public transport in Melbourne, you will need to buy a $6 Myki card from any major train station or 7/11 Convenience Store. Top this up with cash and use it to touch on and off trams. Trams within the Melbourne CBD are free. St Kilda is within 1 zone of the CBD. Day passes, or single trip tickets are available with your Myki Card. From Melbourne CBD, follow St Kilda Road. Turn right at Fitzroy St. Easystay Main Reception is several blocks down on the left hand side; just after Jackson St at 63 Fitzroy Street, St Kilda, 3182. Catch the Frankston and Peninsula Airport Shuttle, and request the Park St stop. For timetable and bookings visit http://www.fapas.com.au, or contact reception to reserve your ticket. Catch the Skybus from the Airport to Southern Cross Train Station in the Melbourne CBD. The cost is around $18.00 each way. From Southern Cross, exit the station and catch the 96 tram outside on Spencer St, heading in the St Kilda direction. Follow tram instructions as above. Easystay Raglan Street offers self-contained apartments only 20 minutes' drive from the Melbourne city centre. Luna Park and St. Kilda Beach are just 2.5 km away. Easystay Apartments are located within walking distance to Acland Street's well-known cake shops and all of St Kilda's attractions. © Copyright – Easystay Apartments Raglan Street All Rights Reserved.